Track your merchants from underwriting to boarding, with insight every step of the way. A robust ticketing system allows you to fully support your merchants and stay updated on any issues. CoPilot allows you to expertly manage your sales team and referral partners, ensuring transparent residual reporting, accurate payments, and automated 1099 mailings. CoPilot’s digital application process with click-for-signature completely streamlines the application process to make new merchant sign-ups a breeze. Applications are available for all First Data platforms. 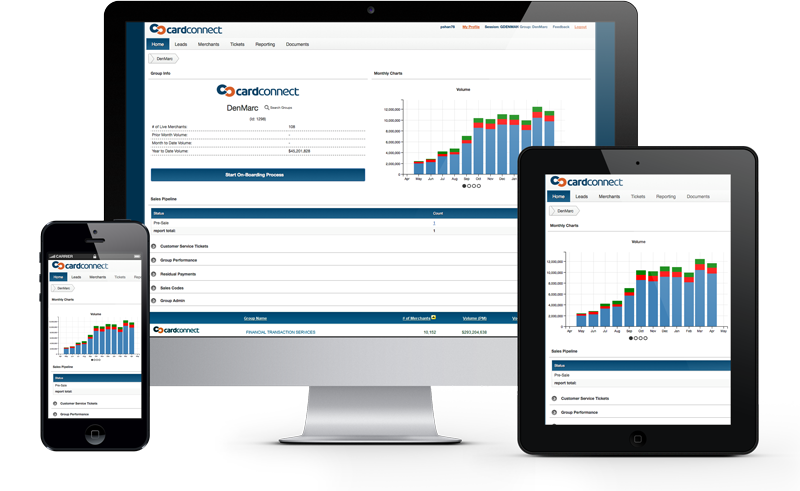 CardConnect simplifies reporting by providing an easily digestible look at your monthly residual. Our reporting system is customizable based on your reporting needs. Keep customers happy when you issue customer service inquiries through our automated ticketing center, and get your customers’ issues addressed in a timely manner. Love the functionality that CoPilot offers but still want to preserve your brand? We’ll work with you to customize the look of CoPilot with your company name, logos, and colors. Attract fast-paced tech companies with an easy-to-integrate API that brings powerful payment features to any application. Access logos, templates, presentations, case studies and white papers with just a few clicks in our fully stocked marketing portal. View chargebacks, losses and ACH rejects in an easy-to-track module. Plus, CardConnect has an entire team focused solely on collection of unpaid fees. We host a weekly webinar series that covers new products, partner offerings, trends in the payments industry, and sales strategies followed by a Q&A. A full archive puts past recordings and presentation slides at your fingerprints. Your dedicated Agent Relationship Manager will foster your growth at CardConnect by helping you navigate CardConnect’s operational guidelines and systems, along with providing industry expertise. With low buy rates and optimal revenue share arrangements, we provide our Partners the ability to increase their profit on their entire portfolio. Integrate with any ERP, business management application, or online shopping cart that requires a secure, efficient payment gateway. Access and view consolidated reporting from several First Data platforms, including Omaha, Nashville, Cardnet, Memphis and North. Gain access to the latest partner program from American Express, offering lower pricing, more control and a single statement. CardConnect has developed technology products that make your offerings more competitive, including a beautiful Virtual Terminal and slick mobile app. We are very aggressive in managing interchange rates for our customers, which allows us to lower your processing costs while increasing your profits.